All is good in the life of Angry Owl – so much so that he decides to join in the beautiful singing he hears every day from a nearby tree. He grabs a guitar, feeling confident that he’ll be the greatest musician ever. To his great disappointment, the other birds fly away from the dreadful noise of his playing. By now Angry Owl really wants to find a hobby so he tries his hand at rugby, cooking, knitting, painting and dancing. But each ends in failure. After a conversation with Mr Dove, he realises that to be good at something, you have to practise and practise. So Angry Owl returns to his guitar and practises until he can play well. 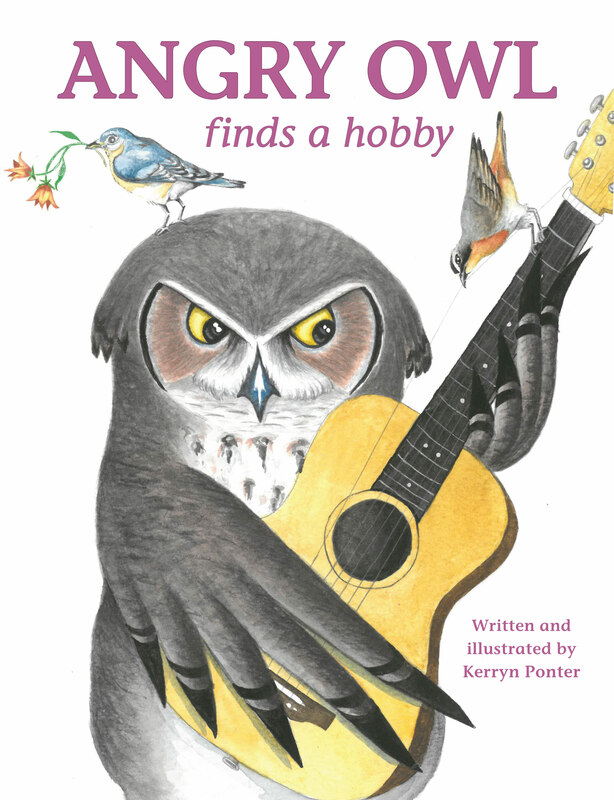 In Angry Owl Finds A Hobby young children will be entertained by the comical situations in which the owl finds himself in his search for the perfect hobby. As ever Kerryn Ponter’s illustrations are delightful and amusing. This is the fourth title in her Angry Owl series. Ook in Afrikaans beskikbaar as Kwaai Uil kry 'n stokperdjie . Kerryn Ponter is a freelance artist with a degree in Fine Art from Rhodes University. As a mother of two young children who love stories, she has plenty of practice in writing and illustrating stories for them. Kerryn Ponter is 25 jaar oud en het ’n graad in die Skone Kunste aan die Rhodes-universiteit in 2015 verwerf. Sy het as vryskutkunstenaar die storie geskryf en pragtig geïllustreer. Kerryn is ’n tuisblyma met twee kinders – haar oudste kind is twee jaar oud en is besonder lief vir stories.